Claire qualified from Telford College in Edinburgh in 2011. 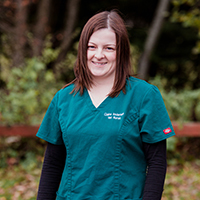 She has previously worked at the Royal College of Veterinary Surgeons in London. She has lots of reptiles plus horses, a dog and cats. Claire is currently studying for a Certificate in Exotics.